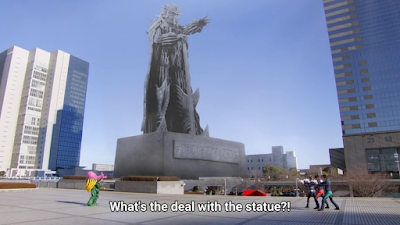 It's 2018 and Kyuranger already had its finale some time ago. But if there's one thing I want to confess right now -- it's the fact that somehow my mind is still stuck in outer space in some way. Just an interesting tidbit -- I've heard that astronauts undergo some physical therapy when they get back to Earth. It's because the change of gravity can be such a huge deal after spending some time in the lightness of space. After enjoying Kyuranger last year -- I just feel like I'm still undergoing some therapy sessions as I enjoy Lupinranger vs. Patranger this year. No, I didn't really go to outer space literally -- I'm just using a bit of an obvious joke, okay? This year is the 30th anniversary of Liveman. Instead of trying to write my top ten favorite episodes of this really good late 80s series -- I decided to write a bit of a reflection on Liveman as a show. It may be a Super Sentai season that makes you think on how to live. Maybe, just maybe that's the reason why Liveman is called Liveman. A few years ago, I could remember reading from Toku Warriors on Hirohisa Soda's science trilogy. 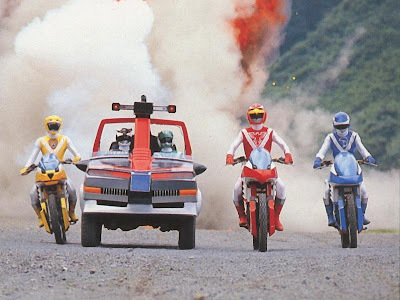 The three shows that focused on them heavily are Bioman, Flashman and Liveman. Liveman itself may be summarized with the issue of balancing science, intelligence, ethics and life. This was the battle of the Liveman vs. Volt. Should I mention why I like Soda's writing is because he's the Super Sentai head writer that just loves to insert the moral lesson of the week episode? That's right -- it turns out to be that the Patrangers haven't discovered the true identity of the Lupinrangers yet. They just went there to have a meal but have to go when the next Gangler namely Namero Bacho is vandalizing the city with his art! Meanwhile, I wonder how did Kogure get into the place so fast? This looks like it's going to be one funny series. He gets the Lupin Collection into that book. The Patrangers are in one sticky situation. Patren-2 gets stuck in snail goo and it gets him stuck. The Lupinrangers get away which I could imagine Detective Zenigata's dubbed phrases or "Onore Lupin!!!!" with this scene. 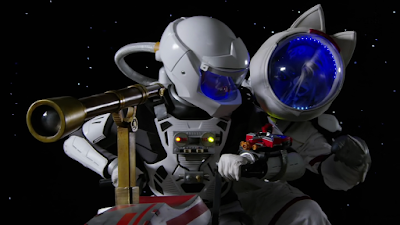 How Many Space-Themed Or Space-Related Toku From Toei Have You Tried Watching Aside From Ucchu Sentai Kyuranger? Kyuranger has ended, I enjoyed it a lot but I still feel like my head's still in space while Lupinranger vs. Patranger is enjoyable with its new concept. But I'd like to do a throwback challenge once more. After I did the Arsene Lupin challenge then let's take the challenge to space shall we? So I'll give what I've seen and I hope you can give your own stand. I lost the Lupin challenge and I wonder if I've won this challenge. Yup, the conflict of Kaito Sentai Lupinranger vs. Zenigata Keisatsu Sentai Patranger has just begun! Last episode showed that both have a common enemy (the Ganglers) but both can't work out with each other. 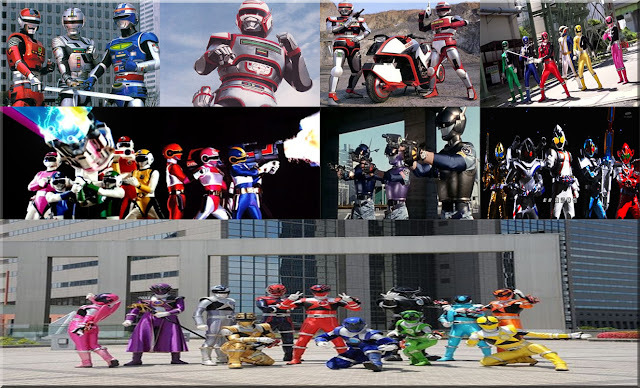 The Lupinrangers have been employed by the yet to be seen descendant of Arsene Lupin III while the Patrangers are out there to arrest both teams. 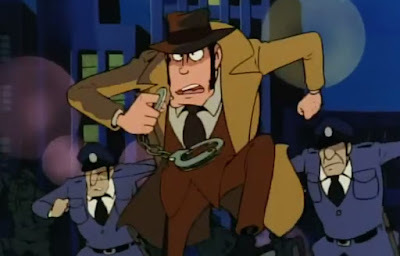 We see how bullheaded and stupid Detective Zenigata Keiichiro can be. The fight between the two Super Sentai trios can be very amusing with all the laser gun violence going on. This really makes me question what direction is the series trying to have? The two series have a common enemy yet they can't even put their differences aside.